A good news for new arrivals in the land of Albion! As we know, riding a mount is a great way to travel through the world of Albion. Since Albion Online launched Hector on June 7th, 8 new mounts has been introduced in the game. Tutorial Mount - Everyone learning the new tutorial can get a mule whatever you character is. 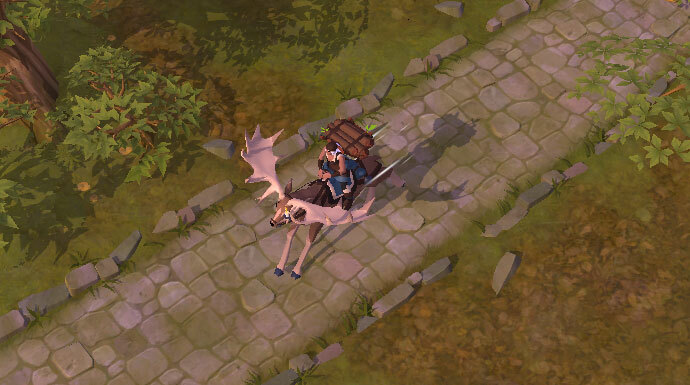 The simple Tier 2 mount is a mule, can be obtained in the starter towns after you finish the tutorial quests. "The Mule gives everybody a leg up when it comes to movement, but falls a bit behind the Legendary Explorer’s Horse both in speed and carrying capacity." The starter towns includes Forest Cross, Highland Cross, Mountain Cross, Steppe Cross, and Swamp Cross. Special Mounts - These mounts are found as rare drops in the open world. 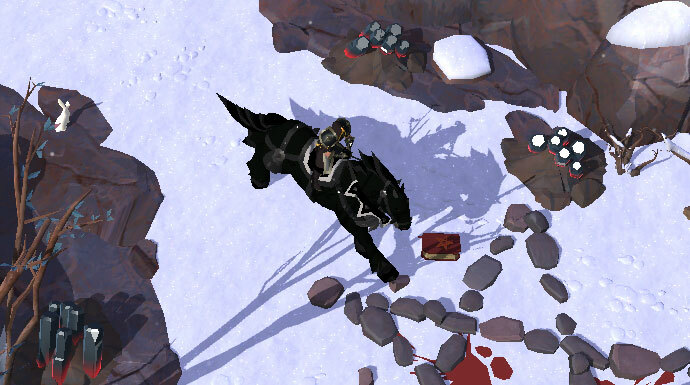 This kind of mount, as alternative to the regular horse, is better for solo-gatherers and couriers. You may have the chance to get a Fawn by killing Giant Stag mobs. Then grow it into a Tame4 Giant Stag in a Pasture. Finally, combine it with 20 Tier 4 Worked Leather at your local Saddler to craft the mount. Giant Stag mobs can be found in the Steppes. Relatively speaking, it has fewer hitpoints and a larger load capacity. The Transport Mammoth mount is the ultimate transport mount for guild operations. Due to its big health pool and defensive bonuses, you may find the group of Transport Mammoth gathering in dangerous areas as they are able to withstand a decent amount of damage. "Ancient Mammoths mobs have a small chance of dropping a Mammoth Calf. 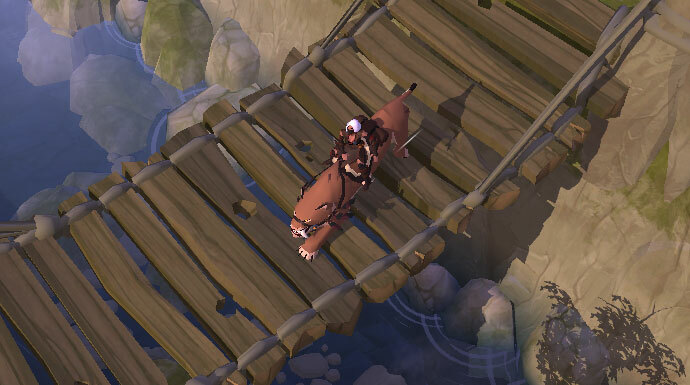 Place this Calf in a Kennel, grow it into a Tame Mammoth, and then combine it with 20 Tier 8 Fortified Leather at your local Saddler to craft the mount." 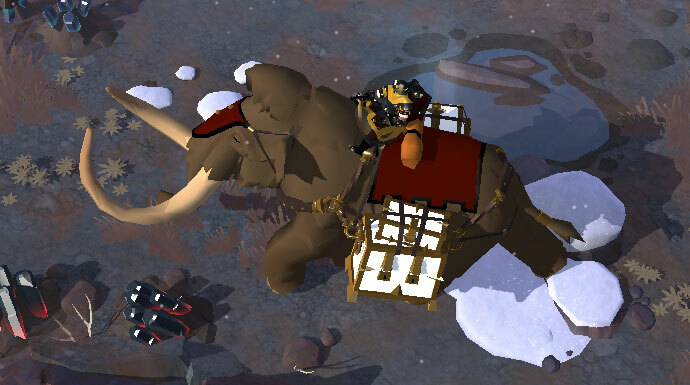 Although the Transport Mammoth's speed is a shortage, it has enormous carrying capacity to make up for the lacking. Faction Mounts - These mounts are faction-specific, and can only be obtained by slaying the faction's bosses in the open world. The elite Tier 8 faction mounts also each boast their own skill! Wondering why the Bonehorse can be included here since it's not a brand-new mount? Because the upgraded Bonehorse has more hitpoints, speed and maximum load now. 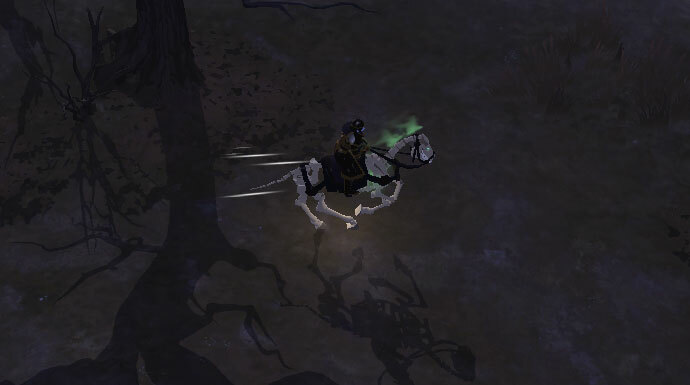 The Bonehorse can be crafted with the combination of a Tier 5 Riding Horse and Necromantic Elixir, which is a rare drop from Undead bosses. "The spirit of an ancient knight's steed has animated the cooling corpse of a sacrificial horse. Loyal and obedient, its appearance nevertheless strikes fear into its foes." Combining a Tier 5 Bonehorse with a Spectral Mask (which is a rare drop from Undead raid boss, the Harvester), you can craft a Spectral Bonehorse. The Spectral Bonehorse mount has a potential skill, Glimpse of the Other Side. You may find Swiftclaw mounts wondering with Keeper scouts in the wild. It's still a fast mount though it sacrificing some speed for survivability. To craft a Swiftclaw mount, follow Keeper bosses because they have a rare chance to drop a Swiftclaw Cub. Grow it into a Tame Swiftclaw then combine it with 20 Tier 5 Cured Leather at your local Saddler to craft the mount. The Rageclaw is best choice for berserker cavalry since they tolerate the fury of battle from birth. You can raise from the most aggressive Swiftclaw cubs. Combined by a Tier 5 Swiftclaw with Sacred Bone Marrow, Rageclaws are the fastest mounts. It should be noted that Sacred Bone Marrow is a rare drop from Keeper's raid boss, the Earthmother. The Rageclaw also has its own skill to instant speed boost in a short time, Predator Sprint. The Warhorse's armor is too heavy to carry additional aggression, but the mount can participate in battles recklessly. The Warhorse's crafting is releated with the Disciples of Morgana as you can get a rare drop from Morgana bosses - Warhorse Saddle. This special drop can be combined with a Tier 5 Armored Horse to craft a Warhorse mount. Comparing with a regular Riding Horse and Armored Horse, Warhorse has better speed. Although the Nightmare doesn't have load capacity bonus, the mount have best speed and survival like the Warhorse. A Nightmare can be crafted by the combination of a Warhorse and Infernal Horseshoes. The latter is a rare drop of killing Morgana raid boss, the Demon Prince. The Nightmare mount has a characteristic skill that leaving behind a trail of flames, which ignites enemies and causes them to run around in fear, Flaming Trail. Here are just some of the tips and guides we have. Feel free to play around to find the ones that suit you best. 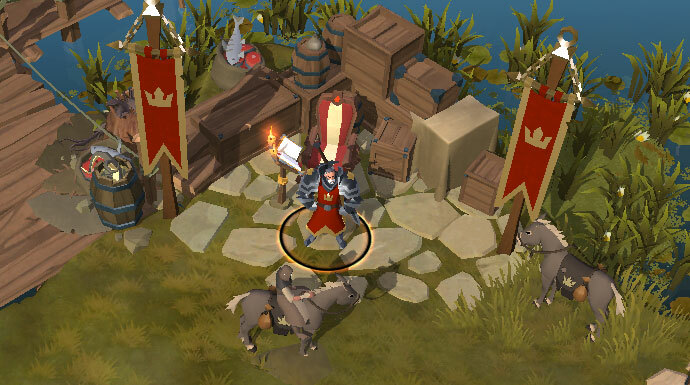 For more Albion Online news and guides, keep it right here on UpAlbion.